These search results are to be used as guidelines only. You must contact INCOE's application engineering department for a complete review. 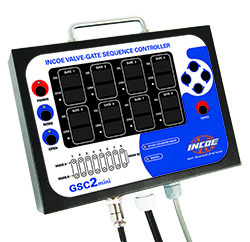 The GSC2mini is a compact, lightweight, timer based, pneumatically/hydraulically actuated sequencing controller. The GSCmini is ideal for valve-gated applications that do not require sensors or linear transducer control. For more product information, download the GSCmini brochure here. ©Copyright 2019 INCOE Corporation. All rights reserved.